Signature Gift Packaging Included For Free! This delightful snowflake jewelry piece from Daniel Lyons of London brings dazzling sparkle to any holiday occasion. Created from silver-plated, sculpted metal and encrusted with Swarovski crystals. 2.25'' wide x 2.5'' high. 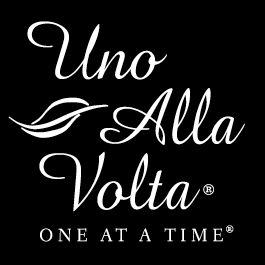 Our London Jeweler, Daniel Lyons, has been delighting Uno Alla Volta customers since 2005. Ask him how he got started in the jewelry business, and he will share wondrous tales of a childhood in Liberia, West Africa, of formative years in Israel, and of travels with his father throughout Mexico. Daniel handcrafts exquisite and sparkling works of art that reinterpret styles from the Elizabethan period to modern times. His highly sculpted pieces feature gold or rhodium-plated surfaces, often accented with hand-set Swarovski crystals and jewelers enamel. © 2019 Uno Alla Volta, LLC all rights reserved. Handcrafted jewelry, home decor, and unique gifts from the hearts and hands of artisans. "[PRONTO!]" is a service mark Uno Alla Volta, LLC.